Left: Shorts and Top stylist's own, Jacket by DKNY. 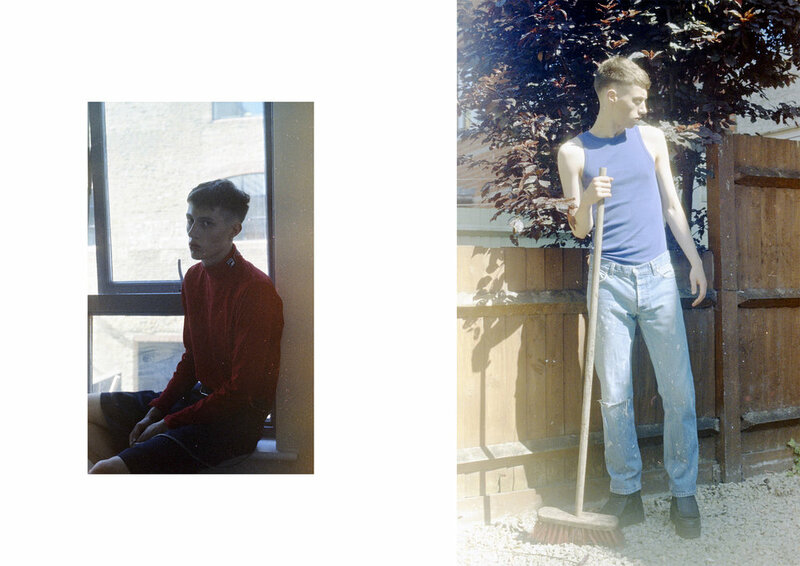 Right: Top by Gosha Rubchinskiy x FILA. Left: Shirt by Blitz London. Right: Boots by Marina Chedel. Trousers by Comme des Garçons, Top by Acne Studios and Belt by Stylist's Own. Shorts by Acne Studios and Belt stylist's own. Right: Jeans by Helmut Lang and Vest by Maison Margiela. Shorts stylist's own and Top by Gosha Rubchinskiy. Tunnel Vision is a coming-of-age story, inspired by the visual and conceptual trope of emptiness. Empty spaces – constructed and deserted architecture or barren lands – have the capacity to store memories of the past they witnessed, and to call for a reliving of essential moments. Photographer Jakrin Von Bueren and stylist Mitja Olenik avoid melancholy as a story-telling tool, and opt to place their character in an existential and aesthetic blur, trimming away non-essential elements, and maintaining a clear stage for self-discovery, with the realm of visibility itself at risk of becoming an empty space.